1st appearance: Buffy the Vampire Slayer, 2000. Skills and abilities: Preternatural fighting ability. Powers: Superhuman strength, speed, stamina, agility, enhanced healing factor far beyond every other slayer. The ability to sense Vampires and use any weapon instinctively. In addition to this she can project herself into the dreams of future slayers and the ability to see the future. 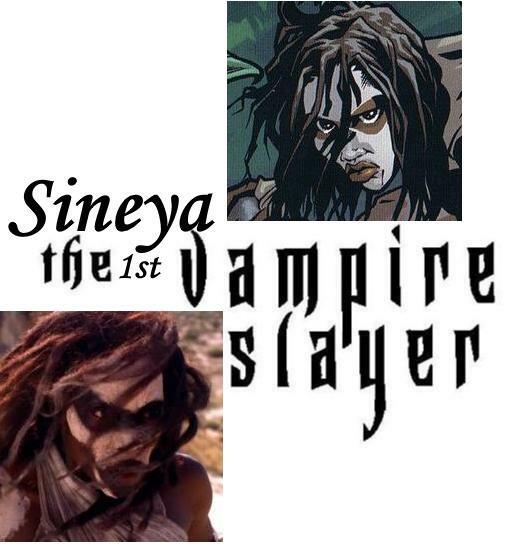 Sineya was chosen as a vessel for the powerful “shadow demon” by the ancient shaman of Africa. Imbued with this incredible power she received all the conventional powers of the Slayer but to a much higher degree. Shunned by her village for being subhuman she never had a watcher and was little more than a killing machine with a thirst for destroying vampires and demons second to non. When she died she gave birth to the “slayer line” which found thousands of girls given a portent of the power she once wielded. She appeared to Buffy in seasons four and seven and as a testament to her power she can appear in the dreams of her successors. This website was… how do you say it? Relevant!! Finally I have found something that helped me. Many thanks! Excellent article. I certainly love this website. Thanks! Мy brotһer recommended I might like this blog. He wɑs entirely rigһt. Thiѕ post actᥙally made mmy day.